13-year-old Aisholpan in "The Eagle Huntress." 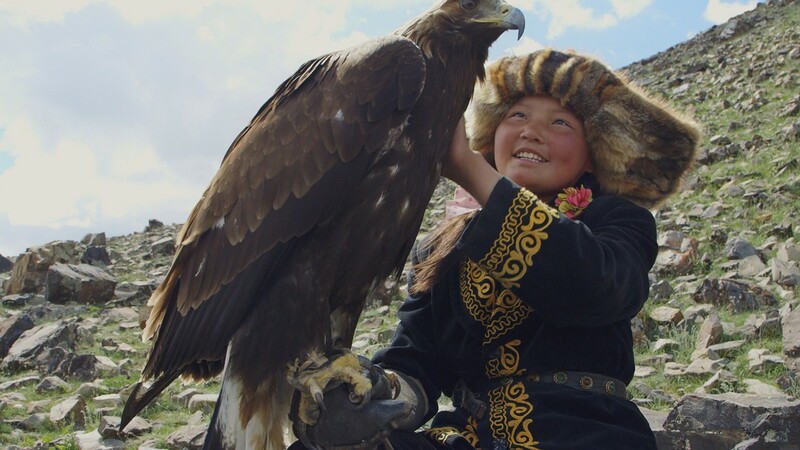 At its heart a simple story of a girl and her eagle, the charming documentary "The Eagle Huntress" follows Aisholpan, a 13-year-old Mongolian girl, as she seeks to become the first female eagle hunter in her Kazakh family. She faces an uphill battle, as director Otto Bell shows in brief interviews with the elders of her people expressing their disapproval, maintaining that girls are too "fragile" to take part in the long tradition of eagle hunting (although it appears the film is somewhat downplaying what's actually a long legacy of woman eagle hunters). But thankfully Aisholpan's family, including her father, Nurgaiv -- himself a well-respected eagle hunter -- remains completely supportive. Nurgaiv assists his daughter in capturing a fledgling eagle from its precariously-perched mountain nest, and Aisholpan is well on her way. She begins to bond with her eagle, teaching the magnificent creature to obey her commands and becomes a faithful companion. Though the two will form a close connection, custom requires that after seven years the bird be released back into the wild. When Aisholpan expresses a desire to participate in the annual eagle festival in the provincial capital of Olgii, where participants show off their (and their birds') hunting skill and prowess, we follow along as the remarkably self-assured young girl trains for competition. This arc lends the film the structure of a sports movie, and Bell melds it with the feel of a nature documentary, getting a lift from narration by British actress Daisy Ridley ("Star Wars: Episode VII -- The Force Awakens") and the beautiful, swooping camerawork of cinematographer Simon Niblett. Aside from those tsk-tsking elders, there isn't much in the way of conflict to the narrative, but the simplified nature of the story works. When partnered with a kid-friendly G-rating (there is a brief scene involving the sacrifice of a lamb and an extended sequence hunting a fox, but both are shot in way that minimize the sight of actual blood) and an appealing girl power message, "The Eagle Huntress" makes a wonderful entry point for parents seeking to introduce a young child to the world of documentary filmmaking.